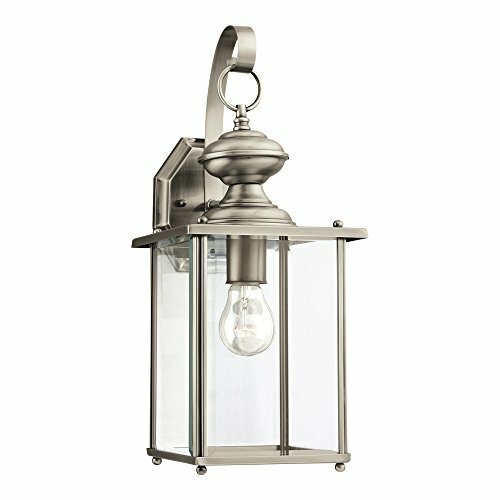 The Sea Gull Lighting Jamestowne one light outdoor wall fixture in antique brushed nickel enhances the beauty of your property, makes your home safer and more secure, and increases the number of pleasurable hours you spend outdoors. The Jamestowne outdoor lighting collection by Sea Gull Lighting delivers a formal, traditional lantern style in proportions that won't overwhelm. Coupled with either Clear Beveled glass, Frosted Seeded glass or Clear Seeded glass, there are four beautiful finishes, including Black, Antique Brushed Nickel, Antique Bronze or Textured Rust Patina. So the perfect design aesthetic will certainly be found to match any style of residential architecture. The assortment includes small, medium, large and extra-large one-light outdoor wall lanterns, a one-light outdoor post lantern and a two-light outdoor wall lantern. Clear bulbs are recommended for use with the Clear glass choices for better aesthetics. Both incandescent lamping and ENERGY STAR-qualified fluorescent lamping (for those fixtures with the Frosted Seeded glass) are available for most of the fixtures, and some can easily convert to LED by purchasing LED replacement lamps sold separately (for those with the Clear glass). There is also a Dark Sky version of the medium and large one-light outdoor wall lanterns for which Etched White Tiffany glass is used to control the light output.